There are many local parking garages in the Times Square area and close to the hotel. You can also count on SpotHero to find your spot in advance, or use the valet parking at the New York Marriott Marquis. To reserve your parking spot today, visit the NY Salsa Congress SpotHero Parking Page and book a spot with rates up to 50% off drive-up. You can also use SpotHero to park all over NYC —learn more here. 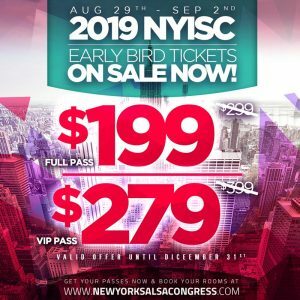 The New York International Salsa Congress brings the world together on the dance floor every year on Labor Day weekend. Featuring live bands, concerts, performance showcases, instructional workshops, and non-stop social dancing all in the center of the world’s greatest city, come see why the NYISC brings thousands of attendees from New York and over 40 countries worldwide for an annual celebration of Latin dance, music and culture. BOOK YOUR ROOM & PASSES TODAY!